The experience of transcending appears to have a lot of profound benefits on human life, far more profound than what we’d expect from ordinary relaxation. (See here for a short overview of some of the most striking effects of TM). On this page we will go to the core of what transcending really is. In transcending = being yourself we discussed how transcending is simply the experience of coming back to yourself, and how this very simple experience has remarkable effects on self confidence, self-acceptance, and just being yourself in daily life. These are beautiful ideas, but how can they be reconciled with our modern mechanical view of life, where the universe seems to work as one big machine? Today it looks like everything can be explained in terms of little balls (atoms) interacting with other little balls according to clear laws of nature. There doesn’t seem to be any need for “something higher” to explain how everything works. Before we can explain this we have to first go through a bit of history, so we can understand how we evolved from the worldview where knowing yourself was indeed the same as knowing this higher universal consciousness, to the current worldview where we see each other much more as individual walking mechanical entities, with the very existence of something higher seriously in doubt. In ancient times human consciousness was seen as a wave on an ocean. Just like one single ocean can rise up in many different individual waves, so was there one invisible universal field of consciousness (you could call it “nature”) that rises up in individual expressions of individual consciousness. We were literally a part of Nature. In the ocean analogy, when the mind would become completely silent, this would mean that the wave settles down completely, and actually becomes the ocean. This is what transcending means, “to go beyond”, in this case beyond the finest stage of thought until the mind comes into a state of complete silence. This means that when we become ourselves, we also get a conscious experience of a state of unity with our “higher self”, the ocean. The texts described how transcending is absolutely essential to develop our full human potential, and in ancient time people had this experience on a daily basis. The result was that they also learned to experience this connectedness to nature, and to each other, on a permanent basis. Over time the natural, effortless method to transcend was lost, however. 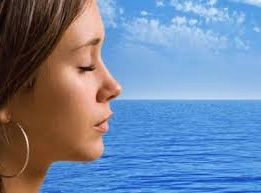 People started to interpret meditation as a form of controlling the mind, usually through some form of concentration. While concentration methods can bring some relaxation, they actually prevent the experience of transcending. Concentration keeps the mind active, and an active wave cannot become silent and merge with the ocean. And so meditation was seen as a relaxation method, rather than what it truly was, a method to come in contact with our true inner potential, which we might as well call a “divine” potential. When people stopped having the experience of unity their worldview gradually started to change. They started to consider themselves as separate entities. The mind is like a muscle, if we train it, it grows strong. If we neglect it, it weakens. When we always have our attention outside, and always keep the mind active, then only the top part of the wave, the most superficial levels of the mind, will start to develop. This will become the part of the mind that we can consciously experience, and so we experience ourselves as separate. The deeper layers of the mind, where we could experience our connection, are not developed. 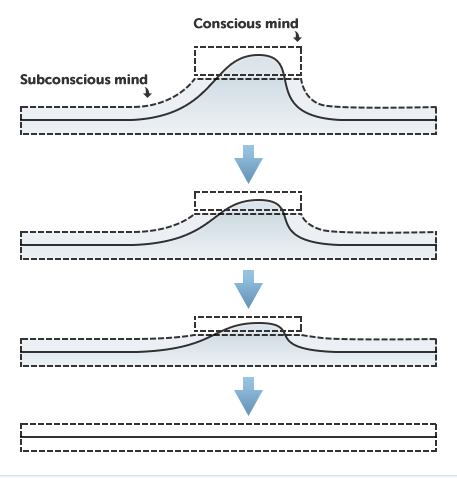 They stay dormant, in our subconscious mind. Sometimes this feeling of being connected to someone still comes through, for example when we love somebody. Love is a feeling of feeling connected to another person. But in general people forgot their connection, to their own higher selves, to Nature and to each other. As such they also started to change their worldview. They still believed there was some higher being that was responsible for all phenomena in Nature, but started to see themselves as separate from this higher being. The only way to connect to this higher being was through his “representatives”, the religions. We came to an age of intermediaries between people and their own higher self. Then the scientists came, and they were able to explain more and more phenomena in Nature in terms of simple material interactions. Suddenly it seemed there was no higher being necessary at all anymore. The whole universe seemed to function as one big machine, with everything interacting according to precise mathematical laws of Nature. Technologies that were based on the scientists’ discoveries gave human beings more and more power over their own destiny. They could bring practical solutions that the religions couldn’t bring and made life a whole lot more comfortable for most people. Things that seemed like miracles a few hundred years ago, like traveling through the air, are everyday realities now. We have hundreds of airplanes traversing our skies every day. The more scientists were able to explain things and create practical technologies based on their increased understanding of Nature, the more the material worldview became stronger and stronger. At a certain moment we even started to see life itself from this purely material perspective. 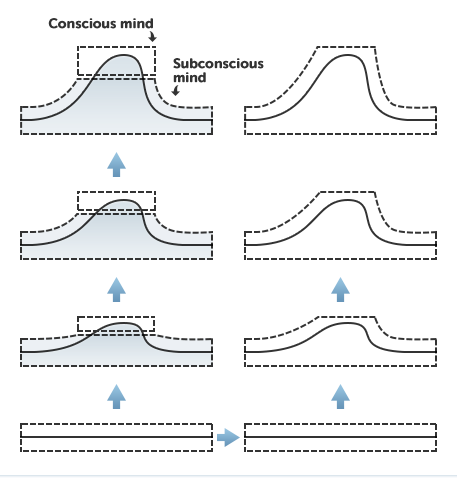 To describe how most scientists see the relationship between body and mind (consciousness) we could use the analogy of the computer. 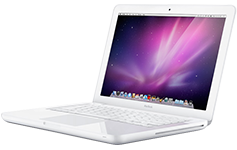 In a computer there are millions of mechanical events (micro switches in computer chips being switched on and off) which all together give rise to the holistic experience of the software. Like this there are millions of electrical processes in our brains that all together give rise to the holistic experience of our consciousness. The computer analogy actually seems perfectly logical, if we turn the hardware off (sleep) then the software stops working, if the hardware is not functioning properly (brain damage) then this will greatly influence the quality of the software experience, and if the hardware is broken it’s “game over”. The computer analogy obviously has a lot of practical benefits. If we understand how the computer works, we can also fix it when it’s broken. The medical breakthroughs that have come from an increased understanding how the body works have saved millions of lives. But is this really the best way to describe life? Are we really nothing more than walking robots in a purely mechanical universe? Most people intuitively feel there’s still something not quite right with this picture. Our hearts tell us that robot’s don’t have self-awareness, love, or create beautiful paintings. 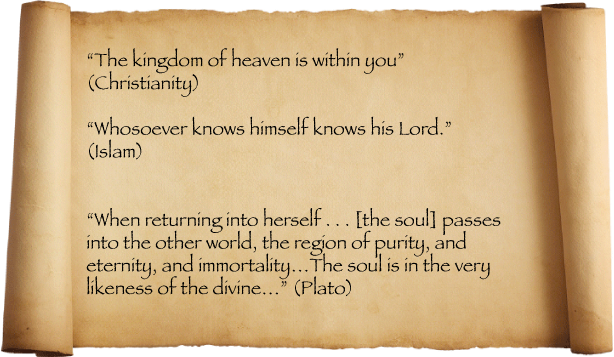 This contradiction between mind and heart has puzzled philosophers for thousands of years, but actually the answer has been there all along. We just have to look at it in a different way, and use another analogy to describe the relationship between body and mind. The analogy of a radio, rather than a computer. Imagine you see a radio for the first time in your life. You may have no clue how it works but you hear music coming from it. Now imagine somebody turns the power off (sleep). You’d see that the music would stop playing. Now he starts messing with the hardware of the radio, (brain damage) and you see that the quality of the music is affected. Then he takes a hammer and smashes the radio, and there’s no more music. If we didn’t know better, we’d be absolutely convinced that the music was coming from the radio itself. But we do know better. 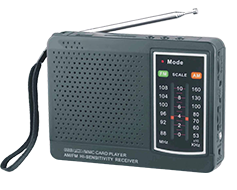 We know that the radio is just a sophisticated instrument to give expression to vibrations of an electromagnetic field, a field that is omnipresent, much bigger than the physical boundaries of the radio. We know that this field is invisible, yet it interconnects everything and everyone. We also know that this one single field can vibrate in many different ways, and create many different types of music, all at the same time. And so we can come back to our original viewpoint, of individual consciousness as a wave on the ocean of universal consciousness. The radio analogy doesn’t contradict any of our medical discoveries from the past few hundred years, as the quality of the music will still depend on the correct functioning of the hardware, but it does allow us to go back to a more spiritual view on life. We are spiritual beings, a part of nature, not walking machines. Consciousness is much bigger than our bodies. Even in physics they are now discovering that all of material creation arises from one singular field, and that this field has all the properties of a singular field of consciousness, exactly like the ancient texts predicted. This new way of looking at the mind also allows us to understand why the experience of transcending, the source of consciousness has such powerful effects on all areas of life, far more powerful than ordinary relaxation. 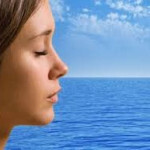 The Transcendental Meditation technique is the rediscovery of the ancient natural and effortless technique to allow the mind to come to that state of pure inner silence, the wave settling down in the ocean. When we experience this regularly we start to literally train our minds to use more of our full mental potential. This means we literally train ourselves to experience both the individual existence of the wave and the experience of the ocean, the feeling of connectedness with everything else. This state is called unity consciousness, the highest possible state of life. This is truly the highest human experience. Obviously it will take some practice before we reach this state fully but the more we evolve in this direction the more the qualities of the transcendent become active in our daily lives, whereas before they were mostly dormant in our subconscious. Often people start to notice changes even from the first few days and weeks of TM practice. 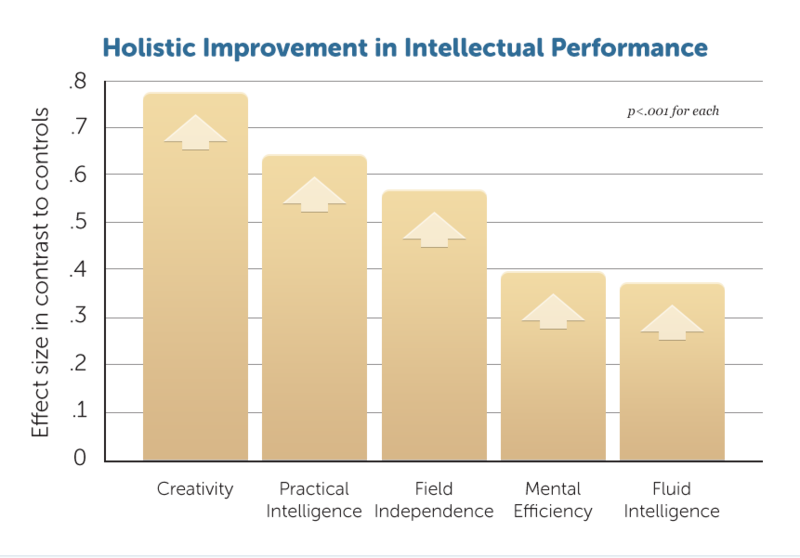 The first and most obvious long-term effect of using more of our full mental potential are the measurable results in terms of our mental capacities, such as intelligence and creativity. But there are many other changes that take place as well. Below we describe some of the qualities of the ocean, the state of unity. By understanding those qualities in more detail we can start to intellectually understand why our most intimate human experiences really arise from that ocean of unity. That is why robots will never have these experiences. Robots don’t have this connection; they are really individual entities without any connection to this field—that’s the difference between mechanical entities and living beings. By understanding these qualities we can also understand how transcending can have such profound effects on our lives. We are used to see everything in opposites: warm-cold, light-dark, love-hate, positive-negative, ups and downs. At the level of unity these contradictions disappear (that is the definition of unity, all opposites get united) and only one quality remains, which the ancient texts described as pure positivity. They described the experience of this state as bliss, pure happiness. The mind is always looking for happiness, because it knows deep inside that this is it’s true nature. This is why the mind will spontaneously transcend if we give it a chance, because it wants to go there. By it’s own nature it is drawn to the transcendent. Human beings are genetically programmed to transcend, we can only make the process more difficult than it really is. Modern research has shown that during TM practice there is a spontaneous increase of the “happiness” hormone serotonin. Ref.BUJATTI, M., and RIEDERER, P. in Transcendental Meditation technique. Journal of Neural Transmission 39: 257–267,1976. This is just a way to objectively measure that the mind comes to a state of spontaneous inner happiness, but it has profound benefits, given the long list of health problems that are related to insufficient serotonin concentrations. The more we can enliven these qualities of the ocean, the longer this state of inner happiness will remain outside of meditation as well, until it becomes possible to be happy 24 hours per day, without any outside reason. We have an infinite ocean of happiness inside of us, we just have to learn to tap from it. Likewise the experience of unity is the experience of complete inner peace. When opposites disappear, then all possible conflicts will disappear as well, and only peace remains. This can also be easily measured in the body, with stress hormones spontaneously decreasing during TM practice. Pure positivity also provides an explanation why TM is so effective to release stress. The best way to destroy negativity is to increase positivity, just like the best way to remove darkness is simply to turn on the light. Negative experiences that are stored in our bodies will spontaneously disappear when we enliven positivity. If we only live on the superficial level of the mind, we lose this state of permanent happiness, and life becomes a rollercoaster ride of ups and downs. If we learn to enliven our true nature, the permanent state of positivity, happiness, and inner peace, permanently remains. Love is the feeling of being connected to someone else. On a superficial level in our daily life we feel this connection, but to a limited extent, with a small group of people to whom we’re very close, our partners, family, friends, etc. Yet sometimes people send money to people at the other side of the world in order to help them after a natural disaster. These are people that we have never met, with whom we have no physical connection whatsoever, and still we want to help, still we feel connected. Why? Robots would never do this. At the source of our mind, the ocean, we are connected to everyone. This is why we can experience love, and why robots can’t. the message from all the great teachers in the past was a message of unconditional love. But love doesn’t come from a dogmatic teaching, it comes spontaneously when we feel more and more connected to others, which by itself happens spontaneously when we transcend more and more. This is why TM practitioners become more loving in their relationships, start treating other people better, feel a stronger connection to nature etc. This is also why more and more religions are now embracing the TM technique, because it is really a practical method to fulfill the aspirations of all the great religious teachings. Maharishi has always said that transcending was once a part of all major religions, but when the practical technique was lost, in most cases only the dogma remained. Omniscience is a quality that is often associated with a higher being, and yet human beings regularly have experiences where they know things they shouldn’t really know based on only sensory observation. We call it intuition, a gut feeling. In some cases, where this quality is clearly present we give it more esoteric names like clairvoyance, premonition, telepathy etc. The intellect cannot grasp these “psychic” experiences, which is why they are often ridiculed by modern science, in spite of the fact that a survey some time ago revealed that 67% of US citizens have had these experiences. At the level of our everyday life we only have limited knowledge of what happens in our direct environment, things we can observe with our senses and analyze with our intellect. At the level of the ocean we speak of a reality in which everything is connected, and where all information is available about everything. Most people sense that they subconsciously know a lot more than what is only in their conscious mind. Sometimes impulses from within that level reach our conscious mind, which we perceive as intuition, a gut feeling that we know more than our intellect is able to tell us. Some people have more talent for intuitive matters than others, just like how some people have more talent for a sport or for playing the piano. They have just developed an ability that is innate to everyone. TM practitioners not only experience their intuition improving, but one of the more remarkable experiences is that, more and more, the right thought spontaneously starts to come at the right time. It is almost as if a super computer exists that is able to calculate all outcomes of all possible thoughts in advance and then, in line with its purely positive nature, creates the thought that will have the most positive effect, both for the individual and his surroundings. A beautiful practical example of spontaneously getting the right thought comes from the students of the Maharishi School of the Age of Enlightenment (MSAE) in the United States. This is a small school on Iowa, with only about 200 students, where children practice Transcendental Meditation throughout primary and secondary school. Each year these students participate in the global Destination Imagination’s creative problem solving championships, a series of competitions in which every year 100.000 of the world’s most creative children take part. As part of this competition they are presented with a problem and have only a few minutes to present a creative solution to it, so this is purely having the right thought at the right time. The MSAE students have won the world championships of this competition 3 times by now, and have won a 4th world championship title of another creative problem solving competition. No other school in the entire world has been able to replicate this. This extraordinary success is one of the reasons why more and more governments support TM in education. The ocean, with infinite creativity, creates everything from itself, it is pure creativity, and infinite organizing power. This creativity is at the source of our consciousness, and the source of our own creativity. That’s why robots can only do what has been mathematically programmed, but they’ll never be able to create a beautiful song or a painting. Robot’s don’t have this connection. TM practitioners notice, usually fairly quickly, that they become more creative, sometimes in extreme forms, like the MSAE students who won the creative problem solving world competitions. But individuals also have the ability to create on a far deeper level: not only with their hands, but also at the level of thought, the level of their own consciousness. This is, in fact, where the true creative power lies. In New Age literature, such as books like “the Secret” there is a lot of mention of positive thinking, visualisations and affirmations. The theory goes that when we focus on positive things, we notice that our environment becomes more effectively positive and supportive. In religious terms we speak if the “will of God” supporting our desires. We desire something, and we see our entire surroundings being organized to support this desire. In practice this only seems to work for some people, for most others any effect of any kind of “thought power” isn’t noticeable at all, so the intellectual mind tends to quickly dismiss it as new-age mumbo jumbo. But understanding how it works also helps us understand why it doesn’t always work: because we try to create an influence from the most superficial part of our conscious mind, where we are separated, rather than from the level where we are connected. 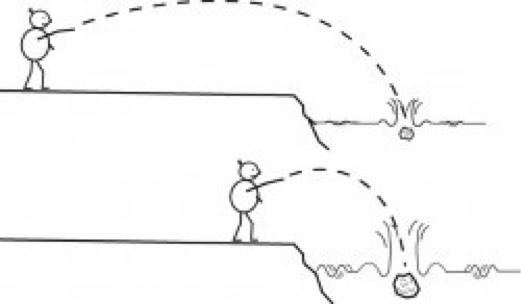 It’s a bit like throwing a stone into a lake from a far distance. You can only throw a small stone, and the waves that you’re able to create (the influence that you can create) aren’t very big. In fact they are hardly noticeable. When we transcend we start to learn how to use a larger part of our mental potential, and it’s like we’re getting closer to the lake. We are now able to throw bigger stones, with bigger effects. Most TM practitioners notice in time that not only will they get the right thought spontaneously, but they will also get more support from their environment for a successful outcome of that thought. This is why TM practitioners generally have more success in life, both personally and professionally, and why so many successful people, whether they are Hollywood directors, actors, musicians or Wall street investors swear by the technique. When we have enlivened our full mental potential, and have the qualities of the ocean lively in our awareness at all times, then our inner peace and happiness are invincible, nothing and no one can disturb it. In this state we have invincible self-awareness, we will always remain ourselves, whatever happens. In this state we have invincible creative potential. There is no problem to which we can find no solution (a bit like the students of the Maharishi school, though they aren’t fully invincible, they haven’t yet won every world championship). In this state we feel invincible connectedness, an unconditional love for others that cannot be overshadowed by anything or anyone.